A press from a later era – Photo by Tim Green via Flickr Creative Commons. William McKenzie sighed as he stared out the window of his father’s print shop. Once again, Alexander Davies was leading a small gang up the street, some in kilts and some in britches, mud and filth spattering their stockings. Davies’s daughter Mary had been William’s friend since their fathers shared their printing business, back when presses first reached the city and everyone was printing Bibles. He missed her more than he could say. “Charles McKenzie, you wretch, I want my books back!” Davies yelled as he approached the shop. He had a cudgel in his hand. The men behind him carried torches and clubs. The books lay in a heap at the back of the store, where they’d been hastily dumped after the midnight raid on Davies’s print shop. Filled with curiosity, William picked one up and started leafing through. Mary did most of Davies’s type-setting, and it wasn’t like her to make mistakes. Was something amiss? “I’ll call out the justices on you!” Davies yelled. “I’ll call the sheriff on you!” the elder McKenzie responded. “I’ll…” The back and forth continued with all the agile wit of two unimaginative elders, while William peered at the pages of the book. There were letters in the wrong places, but something about them seemed odd. There was only ever one to a page, and near the top, where they would be easy to find. Grabbing a scrap of paper and a quill, William started noting them down. This looked like a code, and he could only think of one person who would put it there. If something was the matter with Mary then he desperately wanted to know. A flaming torch sailed through the window and a junior printer rushed to douse the flames. Another landed on a heap of loose papers, which immediately ignited, sending men scurrying to beat out the fire. Smoke clouded the air, and there were sounds of violence from the direction of the front door. Reaching a page without errors, William set the book aside and stared at the long string of letters in front of him: iloveyouwilliammckenziewillyourunawaywithmemary. A quick slash of the pen divided them into words. His heart raced as the meaning sank in. Copyright claims in 17th-century Scotland genuinely turned to violence at times, as well as many contentious legal disputes. 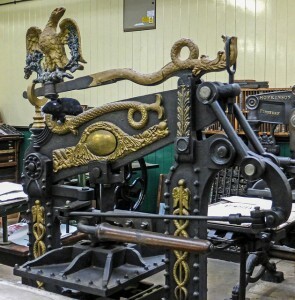 Costs, profits and pride made for high stakes in the early days of print. Next time you see a video taken off YouTube for copyright infringement, be glad no-one got beaten up over it. If you enjoyed this story then you might like more of my historical fiction – check out From a Foreign Shore, my collection of historical and alternate history stories, only 99c on Kindle.